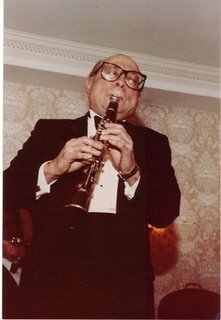 Harold Seletsky (1927-2010) clarinetist, composer and bandleader of The West End Klezmorim. He composed music for films, commercials, opera, ballet, and has written jazz and Yiddish songs. His award winning scores for commerci als include those for Eastern Airlines, Air France, Chevrolet and U.S. Steel. As an instrumentalist, Harold performed with the Houston Symphony as well as numerous music ensembles in New York City.